Cellulite looks like an unevenness of the skin that sometimes is described as having an orange peel or cottage cheese appearance. Cellulite forms because globules of fat push against the connective tissue beneath your skin. Common areas of the body affected by cellulite include the thighs, abdomen, and buttocks. Most children, even those who are overweight, generally do not develop cellulite until after puberty. Girls usually notice cellulite after puberty. Cellulite affects 85 percent to 98 percent of post-pubertal females of all races, according to the "Journal of Cosmetic Laser Therapy." This means that most girls will start to notice dimples and lumps on their skin, regardless of whether they are fat or thin. Many factors play a role in the development of cellulite. Boys can develop cellulite, although not as commonly as girls, because the connective tissue bands under male skin are crisscrossed like a mesh, so the fat is less likely to bulge through it to create a lumpy appearance. 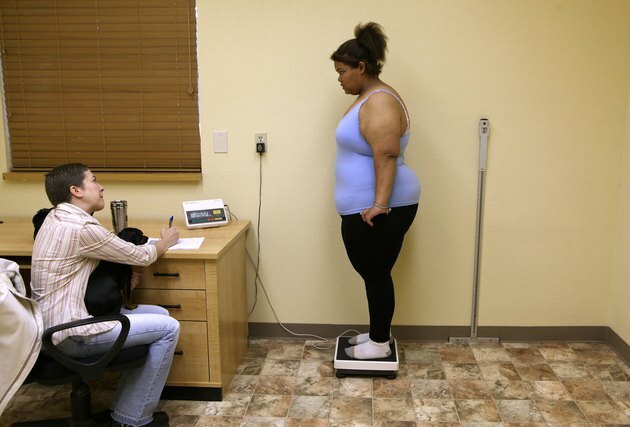 Girls also store more fat, as a result of the hormone estrogen, according to a report in "The New York Times" that quoted several medical school professors on the subject. Many factors play into whether a person develops cellulite. Apart from gender, with women being far more likely to develop cellulite than men, the amount of fat a person has on her body determines the amount of cellulite. Unfortunately, losing weight does not mean losing the cellulite for good. Genetics, age, and thickness of skin also play a role in the appearance of cellulite, says the Mayo Clinic. There are no miracle treatments or products to make cellulite vanish. However, the best way to reduce the amount of cellulite if a person is overweight is to decrease excess body fat with a combination of diet and exercise, including aerobic activity and strength training. Anti-cellulite creams may offer a temporary improvement to the dimpling of skin. These creams work by mildly irritating the skin and causing swelling, which can camouflage the cellulite. They do not get rid of it, and the cream needs to be reapplied. Massaging cellulite areas works on the same principle as the anti-cellulite creams. By causing swelling, the massage temporarily reduces the appearance of cellulite. There are other expensive treatments, such as laser therapy, injection of drugs into the cellulite, or liposuction. None of these would be recommended in children, and none of these therapies have been shown to get rid of cellulite effectively and consistently. Probably the most important thing for children with cellulite is to give them body confidence by refocusing their attention away from problem areas and reassuring them that many people have cellulite; they are not alone. Reinforcing a positive body image can be vital for teenage girls especially, since cellulite appears at puberty, a self-conscious and vulnerable time. Since cellulite really has no cure, it is important to help them to accept and not obsess about their appearance. Journal of Cosmetic Laser Therapy. Dec 2004; 6(4):181-5. "Cellulite: a review of its physiology and treatment."